Cardinal Vincent led a group from the diocese on pilgrimage to Fatima from 24th to 27th April. Celebrating Mass with the pilgrims in the Chapel of Apparitions on the site where Our Lady appeared to the children a century ago, the Cardinal said Mary’s message ‘addresses directly our quest for peace’, especially ‘peace in our troubled world’. He explained that Our Lady asks us to pray constantly for peace in ‘a prayer in which we seek to unite ourselves to her Immaculate Heart’, adding: ‘as we pray, we think especially of all those who are persecuted for their faith, who are killed because of their faith in the love of the Sacred Heart of Jesus, a faith which they treasure more than life itself’. Drawing on the lessons from the lives of the children, the Cardinal explained that God chooses us for the gift of faith because of ‘the simplicity and openness of our hearts’; that choosing to follow him we can expect, like the children, to enter into ‘a pathway of suffering’; that we learn from the children the best response to God’s gift of faith ‘is to be that of prayer, penance and self-offering’; that, like the children, we are to have ‘a longing for our heavenly home’ and to trust that ‘Mary is with us always, guiding us home’. The Cardinal led the pilgrims in the act of consecration to Our Lady for the diocese and for all ‘individuals and nations which particularly need to be entrusted and consecrated’ to her Immaculate Heart. The act of consecration and the litany of intercessions that followed were the same ones which Pope St John Paul II first used on his pilgrimage to Fatima on 13th May 1982. 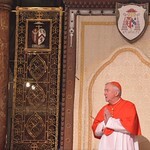 The full text of the Cardinal's homily.